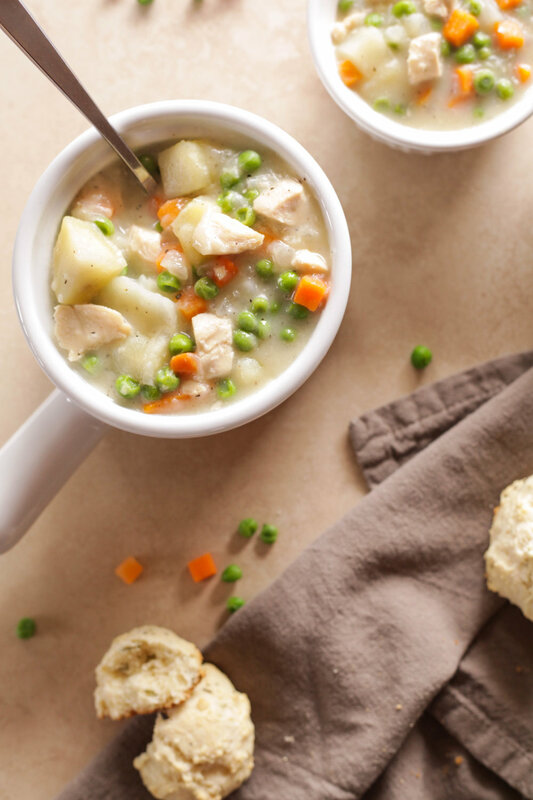 chicken pot pie potato chowder & rosemary drop biscuits. boy howdy. welcome welcome, cozy fall meals. i am in lurrrve with chicken pot pie. i reallllyy lurrve the goop inside a chicken pot pie. so i figured out a way to essentially eat the innards of a chicken pot pie without feeling like complete dooky about it. this is basically a hearty beef & potato stew, hold the beef. but i like to look at it as chicken pot pie chowder, cuz that's how i roll. the base of this chowder is made up of a little mashed potato, lots o onion, and chicken broth. add some chicken, peas & carrots, and some more chunky potatoes, and you've got yourself a decently healthy and hearty meal. nowww ya know i'm all aboot the texture. so i had to make some simple biscuits to go on the side. throw some fresh rosemary in there and this whole combination is FA BO LO US. holla back, young'n. woo woo. lemme just tell yaaa, a little bit of butter and flour and rosemary and some other stuff baking in the oven is just... ta die for. instant cozy home. hmmmm i wonder if it would be the opposite of wise to just throw some sprigs of rosemary in the oven and let em smell up the joint. sounds like a dry brush fiyah hazard waiting to happen come to think of it..
i've got a bone to pick with grocery stores and their frozen crinkle carrot selection. i would've ideally used crinkle carrots here, because i love them!! but they are weirdly hard to find! what gives?! howeverrr, these peas & carrots come in the same bag, so ya win some ya lose some. ok so this is mostly all the things you'll need for this chow chow. not too shabby, eh? make sure you keep half of the potato a bit firm and less cooked, for the stewy chunks. they're necessary. also, peas & carrots sure are cute. "from that day on we was always together - jenny and me was like peas and carrots." got forrest gump on the brain because i just realized today that maybe i want to be him for halloweener. running-across-the-country version forrest with straggly hair, cool hat, nikes and smiley face tee. HAHAAA i just now realized that running-across-the-country forrest is basically my spirit animal/style icon. minus all that pesky running. this meal comes together fairly quickly once you have your tater and chicken cooked, and veggies chopped and ready. in fact, you can totally cook the chicken and potatoes in advance. like a day in advance. same with the biscuit dough! be sure to keep the dough chilled til just before you bake. you don't want the butter to get all melty. and theeere you have it! a super cozy, hearty, healthy-ish, comforting dish. that rhymes. To make the rosemary biscuits, preheat oven to 350 degrees F. Lightly spray and flour a baking sheet. Combine all dry ingredients in a bowl. Cube the butter and cut through the dry ingredients with a fork until crumbly. Use your hands to incorporate the butter into the flour mixture. Add the milk and mix gently until a dough forms. Add either a TB of flour or a TB of milk if dough is too sticky or dry. Lastly, add the chopped rosemary and mix gently. Drop golfball sized spoonfuls of dough onto the baking sheet. Bake for 22 minutes or until bottoms of biscuits are golden brown. I suggest putting the biscuits in the oven just as you start to prepare the chowder on the stove. To make the potato chowder, peel and cut the potato in half (as shown in photos above). Bring a pot of water to a boil. Boil the potato in water, removing one half after 10 minutes, and the other half after 20 minutes. Allow the lesser cooked half to cool slightly, cut into cubes and set aside. Place the well boiled half of potato in a bowl with olive oil, milk, and salt and roughly mash with a potato masher or fork. Set aside. Cook the chicken as desired. I usually cook a chicken breast on medium/low heat in olive oil for about 4 minutes per side, lightly seasoning each side with salt, pepper, and/or garlic powder. Cut the chicken into cubes. In a large pot, melt butter on low heat. Add flour and chopped onion, stirring with a spoon. Add 3/4 cup of the reserved potato water from the boiled potato and stir until a thick roux forms. Add chicken broth and black pepper and increase heat to medium/high, stirring frequently, until the mixture begins to boil (about 5 minutes). Add the mashed potato, cubed chicken, peas & carrots, and slowly add the salt (different chicken broths can be more or less salty so beware of how much salt you add in addition). Simmer on medium/low for 5 more minutes. Lastly, add the cubed potato chunks and gently mix. Serve immediately with freshly baked rosemary drop biscuits! I plopped the biscuit right smack into the chowder. You should, too, yessiree Bob. i want you back, biscuits. i made these like a month ago. it is currently sunday morning and i am a hungry hungry sunday soul with hardly any food in the house. so basically, i'm torturing myself right now. when these came out of the oven, i immediately shoved one in my mouth. in that moment, i dubbed these, "the best thing i've ever made in my life." it's so funny to think about where you get inspiration from. in this particular instance, i was inspired by some taco bell and/or kfc commercial i heard on pandora and they said something about jalapeño honey. i was like, sayyy whaaaa? and i decided i wanted to make some. what should i make alongside my jalapeño honey? delicious loaded biscuits, of course! bless you, kfc/taco bell radio ad. first, you're gunna need some bacon. i coated the cheddar cubes in flour. i don't really know why. sometimes when i see recipes with chocolate chips, it says to toss them in flour before you add them to whatever you're making. i guess this is the principle i was going for. perhaps to keep the cheddar cheese treasure troves intact and maintain composure within the biscuit. although there's absolutely nothing wrong with an extra oozy cheesy biscuit, either. puree one chopped jalapeño in the food processor. add honey and continue to blend until the texture looks good. i wish i had left some of the jalapeño seeds in. i removed all of them because i thought it was going to be super spicy already. i could have used some extra heat! the jalapeño honey turned out sort of runny, but i found that chilling it in the fridge for a bit helped to thicken it up. next time, i'll dry out or roast the jalapeño beforehand so there's less water content. i have the hardest time typing "biscuit." i always start typing "busi..." like "business." i'd rather just change both spellings to "bizkit" and "biznass." cube your semi-cold butter and mash it into the dry ingredients with a fork. add buttermilk and combine until the dough looks shaggy. "shaggy" is a very strange word to use when talking about food. oh wellz. add your prepared bacon bits, cheddar, and chives. fold it all togetha! i just rolled up golf ball sized bizkits and plopped em on parchment like you would cookies, but you could carefully roll out the dough and use a biscuit cutter if ya mean biznass with your bizkits. you've got some tastyass biscuits on your hands. crispy cheesy crusters like this are toward the top my list of favorite things in life. yum. they are warm. warm and waiting for a drizzle of jalapeño honey. and they smell so freaking good. ooooh my cute little le creuset honey pot is making its debut! i love it so much. i actually got it at a fancy goodwill for $3. victory! i'm so glad this recipe makes a good amount of bizkits. i had them for breakfast for like a week. peter gobbled some up when he got home, too. a positive critique from him is pretty much the highest achievement, in my mind. he is suuuper critical about food quality and he helps me a lot. tummy. growling. at maxx power. super savory and buttery biscuits with spicy sweetness on top. seriously, they were so good. i ate like 4 of em right away and had to go lay on the floor for a while. Slowly add about 3/4 cup of honey and continue to puree together until the combined. Add to small bowl and place in fridge to thicken. Store in an airtight container or jar. Cook 6 slices of bacon in a frying pan. Set aside and later chop into bits. Cube 6 oz. of sharp cheddar cheese. Toss in a small bowl with flour to coat. Set aside in fridge. In a large bowl, add flour, sugar, baking powder, and salt. Mix together. Cube or slice the butter into sections. Using a fork, mash the cubed butter into the dry ingredients until they begin to combine and the dough looks lumpy. Using your hands is most helpful here. Add buttermilk and mix until the dough looks shaggy. Knead with hands just until mixed. Add the cubed cheddar, bacon bits, and chives. Fold everything together until all components are evenly incorporated. Preheat oven to 350 degrees F. Form golfball sized biscuits and place on parchment paper on a baking sheet. Bake for 25-30 minutes, or until golden brown. Drizzle with jalapeño honey over the top, or dip it right in!